This article contain brief, fast facts in a history timeline format of Wright Brothers History in the United States of America. The Wright Brothers Timeline covers important dates and events in the years when Orville and Wilbur Wright developed their first "Flying Machines and piloted the first powered airplane. The Wright Brothers Timeline of inventions and the first flight are detailed together with pictures of the gliders and the 'Flyer'. Learn about the important dates and events in the Birth of Aviation with the Wright Brothers Timeline. 1901: Orville and Wilbur test their manned glider that has a 22-foot wingspan and traveled 389 feet. 1903: They build their first powered biplane called the "The Flyer". It weighs 200 pounds, with 12 horsepower. 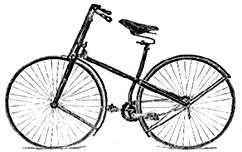 Wright Brothers Timeline Event 1: 1896: Wilbur and Orville begin to manufacture and sell bicycles of their own design. Wright Brothers Timeline Event 3: 1900: Wilbur and Orville build a "wing-warping" glider that is like a giant kite. 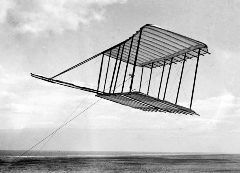 Wright Brothers Timeline Event 4: 1900: Wilbur and Orville build a manned biplane glider that has a17.5 foot wingspan. Wright Brothers Timeline Event 5: 1901: Wilbur and Orville test a manned glider with a 22-foot wingspan that traveled 389 feet. ● They realized that they needed engine power, rather than wind power, to create a "flying machine" that would fly over longer distances. ● The biplane weighed 200 pounds, and produced about 12 horsepower. ● They call their airplane "The Flyer"
Wright Brothers Timeline Event 9: 1904: Wilbur and Orville build the "Flyer II" with a 40-foot wingspan and 15-16 horsepower engine. They test the Flyer III on a field in Dayton they call 'Huffman Prairie'. The engine was not powerful enough to lift the aircraft without strong winds so they built a simple catapult using a derrick and a track to get the plane into the air. Wright Brothers Timeline Event 10: 1905: Wilbur and Orville then built the Flyer III. The Flyer III became the world's first practical airplane. ● Their new design had a 40-foot wingspan with a 20 horsepower engine. Interesting facts about the birth of the airplane are provided Wright Brothers Timeline and biography detailed below. The history of the Wright Brothers is told in a factual timeline sequence consisting of a series of interesting, short facts and dates providing a simple method of relating the history and biography of the Wright Brothers for kids, schools and homework projects. Wright Brothers Timeline Event 7: 1900: September 1901 - Wilbur presents a scientific paper called "Some Aerial Experiments" to the Western Society of Engineers challenging the accuracy of the accepted 'lift tables'. Wright Brothers Timeline Event 8: 1901: October to December - Wilbur and Orville build a wind tunnel to test different wing shapes for lift and drag. Wright Brothers Timeline Event 9: 1902: The Wright Brothers build a new glider with a 32-foot wingspan and record their longest flight of 622 feet which lasts for 26 seconds. Wright Brothers Timeline Event 10: 1903: Wilbur and Orville, together with their mechanic Charlie Taylor, build an engine for their biplane design they call "The Flyer". It weighs 200 pounds, and produces about 12 horsepower. 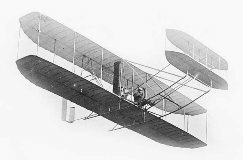 Wright Brothers Timeline Event 11: 1903: On December 17, 1903 the Wright brothers make four engine powered flights over the sand dunes at Kill Devil Hills, Kitty Hawk, Dare County, North Carolina. Orville piloted the first flight followed by Wilbur. They were the first sustained and controlled flights that had ever been made. Wright Brothers Timeline Event 12: 1904: Orville and Wilbur built the "Flyer II" with a 40-foot wingspan and 15-16 horsepower engine which they tested along a track at Huffman Prairie. Wright Brothers Timeline Event 13: 1905: Orville and Wilbur built the Flyer III with a 40-foot wingspan and a 20 horsepower engine. Their record breaking flight covered 24 miles and lasted 39 minutes. 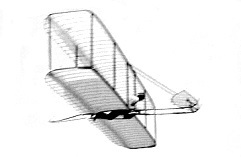 The Flyer III became the world's first practical airplane. Wright Brothers Timeline Event 15: 1908: Wilbur and Orville make record breaking flights on their Model A Flyer. Orville flies in the United States and Wilbur flies in France. They become world famous. Wright Brothers Timeline Event 16: 1909: The US government negotiates the use of the Wright Brothers airplanes. Wright Brothers Timeline Event 17: 1909: Orville and Wilbur establish the Wright Company. Wright Brothers Timeline Event 19: 1910: Orville and Wilbur open the first civilian flight training school in Montgomery, Alabama. Wright Brothers Timeline Event 23: 1948: Orville dies of a heart attack on January 30, 1948 in Dayton, Ohio. The article on the Wright Brothers Timeline provides detailed facts and a summary of some of the most important events and dates in the history of the United States - a crash course in American History. The following video will give you additional important facts, history and dates about the personal and political lives of all the US Presidents.